Appleby is famed around the world for its ancient Horse Fair and for the throng of colourful characters who gather on Gallows Hill (Fair Hill) every June. The date used to be fixed by the date of the Derby at Epsom; Fair Hill week began on the Sunday following the mid-week Classic race which is held in the first week of June. This Sunday is known as Visitors' Day, when people can walk between the rows of caravans, watch the horses being washed in the River Eden or "flashed" up and down the road, have their fortunes told, or buy cheap goods from the many side stalls. The real selling of the Fair takes place in the following three days. Wednesday used to be the sale day, but in recent years, especially if the weather has been very wet, many of the travelling people pull off the Hill early, so the timetable is less predictable. Appleby town itself prepares for the onslaught in different ways. The public houses take up the carpets and brace themselves to accept the cash and the mud and spilt beer from large numbers of drinking strangers. Extra police and RSPCA men are on duty and everyone works longer hours than normal. It is probably the largest influx of people into the Eden Valley each year. If you plan to visit, please read the Official Appleby Fair web site. Appleby is particularly associated with the striking "gipsy cobs", both horse and pony-sized: these days, they are mainly "coloured" (pinto) - black and white / piebald, or brown and white / skewbald - with heavy bone and feather. Staggering sums of money are asked for these animals which apparently can change hands several times during the Fair. The price asked often seems to have less to do the horse's real quality than its owner's pride. Yet there have been some famous show driving horses sold through the Fair which were real bargains. It takes a horseman to know which are worth buying and which should be passed by. Ann Brown, who bred Fell ponies at Shap (including my mare Coppyhill Suzanne, a.k.a. Ruby) and who regularly bought animals from the Fair, said that it would take several weeks to find out what temper of horse or pony you had really bought from Appleby: "they're shell-shocked." Standardbred trotters and pacers are often shown off at high speed up and down the roads, with the drivers crying "Mind yer back!" to the unwary who stroll into their path. Many are also brought to Appleby to compete in the official harness races which are associated with the Fair. Fell or Dales ponies may seen there, but they may well be unregistered or crossbred, though many of the smaller coloured cobs will have a Fell or Dales as mother, or grandmother, or somewhere in their background. 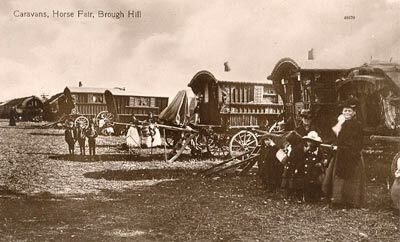 The photo (left) of Brough Hill Fair appears to date from the first decade of the 20th century - there is an open topped car and a telegraph pole in the background. Note that there are only two grey horses visible and no "coloured" (piebald/skewbald/pinto) ones. Bert Morland told me that fifty years ago (1950s) it was still the case that 70% of the vanners pulling gipsy caravans (bowtops, benders, vardoes, ledge vans, Reading vans, etc) would be solid coloured, dark brown, bay, or black, with evident Clydesdale blood, just as can be seen in this early photograph. The broken coloured piebald/skewbald influence came with stallions imported from Ireland, and in the 50s it had not taken such a strong hold as it has since. Obey Coates (37), Watchgate, Dartford, was not present when a charge against him of driving a carriage furiously on 7th June came before Eden magistrates at Penrith on Friday. However, it was proved in his absence and he was fined £400 with £42 costs. The offence dates from 1847. There had been a Fair at Brough since 1330. Originally it was over 4 days, the two before St Matthew, St Matthew's day itself and the day following (September 21st). From 1752 it was shortened and moved to September 30th and October 1st, with slight variations if one of these was a Sunday. Fell ponies were often referred to around the turn of the 19th/20th centuries as either "Fell Galloways" or "Brough Hill ponies" because most of the young stock were sold off at this "back-end" sale. Other fairs were held during the year at Penrith, Wigton, Rosley (near Wigton), Appleby, Kirkby Stephen and Meaburn, but Brough Hill was acknowledged as "the" sale for the hill ponies. 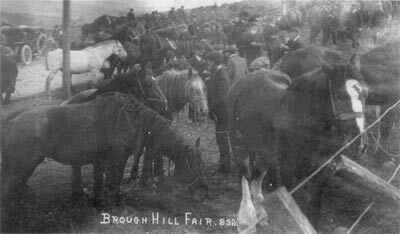 A report from the "Herald" in the first week of October 1902 shows that Brough Hill Fair did well: "Brough Hill Fair was thronged with horses, cattle and sheep and, with the benefit of fine weather, trade was good, as much as £65 being obtained for broken horses. A fair trade was done in Highland cattle." The annual Brough Hill Fair brought the usual crowds of gypsy horse dealers to Brough for two days. There was a larger attendance than usual, including train loads of visitors from the industrial centres of Yorkshire and Lancashire. Fell Galloway horses were the feature of the fair, with large numbers of these from Hawes and the other fell districts. An exceptionally good trade was experienced for cart horses, good animals changing hands at from £40 to £70 and one animal was sold for £94 10s. The following year, 1908, the "Herald" reported prices of: £8 to £12 for unbroken ponies, and £14 to £24 for Hackneys; however, broken cart horses only made from £28 to £40. 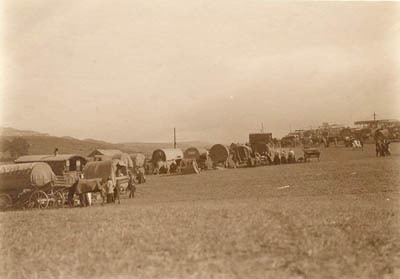 Garnett (1910) describes the fair as "one of the largest if not the largest fair in the North of England, and immense numbers of cattle, sheep and horses, especially unbroken ones, fell ponies and merchandise of every description were shown ... Scotch dealers ... with ... droves of Highland black cattle, sheep and Galloway ponies. Now ... [it is] much reduced in size, scarcely any cattle and but few sheep ... it still retains its prestige for unbroken colts and fillies and fell ponies." Brough Hill Fair was known for its cold, clashy (wet and windy) weather! "Reet backendish - real Brough Hill weather." A report from the "Herald" in October 1952 says: "Brough Hill Fair took place in typical weather, with tents blown down by an icy wind. The coconut stall had to be dismantled before the gale ripped the canvas to shreds." Sadly, by this date the fair's decline was very evident: "There was almost as much interest in car sales as in horses."